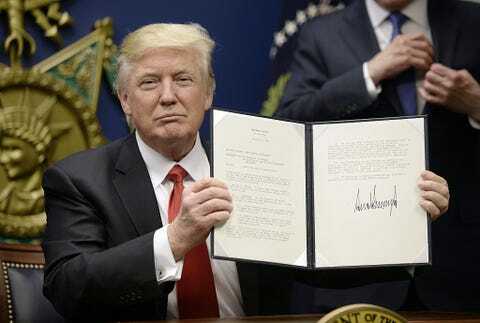 Trump’s efforts to stir up worker resentment focus almost exclusively on situations in which foreigners can be depicted as the real culprits. He has no difficulty demonizing undocumented immigrants or the Chinese government, yet he rarely has any critical words for the traditional targets of populist anger: the super-wealthy and powerful corporations. On the contrary, those interests have enjoyed a privileged place during the Trump era, receiving lavish benefits in the form of tax breaks and regulatory rollbacks. The latest example of the latter came less than 24 hours after Trump concluded his remarks in the House chamber. His Consumer Financial Protection Bureau announced plans to gut restrictions on payday lenders that were developed during the Obama Administration and were scheduled to take effect later this year. The new rules were designed to put the responsibility on lenders to make sure their customers could afford the loans they were being offered. This was seen as a necessary safeguard in an industry notorious for charging astronomical interest rates to vulnerable customers who frequently ended up with massive debts after rolling over a series of short-term loans. Payday lending has effectively been outlawed in about 20 states, but the Obama-era rules would have made a big difference in the rest of the country where the disreputable business is still allowed to function with annual interest rates of 300 percent or more. It will come as no surprise that many of the latter states are ones in which Trump enjoys high levels of popularity. I can’t help but wonder what working class Trump supporters will think of this policy. Coal miners cannot be completely faulted for believing that Trump’s moves to dismantle power-plant emission controls may help them get work, but will struggling low-income families be cheered to learn that the administration is making it easier for payday lenders to exploit them rather than following the lead of the states that put a lid on usury? Or, to put it more broadly, how long will Trump be able to pretend to be a working-class populist while pursuing the worst kind of plutocratic policies? Every industry has its faults, but there are only a few for which it can be said that society would be better off if they did not exist at all. One member of that special group is payday lending, the business of providing short-term cash advances to desperate people at unconscionably high interest rates with the expectation that they will not be able to repay the money and thereby get caught in an ever-worsening debt trap. While stricter rules are clearly needed, the good news is that the sharks are no longer operating with total impunity. The Dodd-Frank Act opened the door to federal action on payday lending, and the Consumer Financial Protection Bureau is starting to act on that authority. Last November, the agency ordered Cash America International, one of the largest predators, to pay $19 million ($5 million in fines and $14 million in refunds to customers) for using illegal robo-signing in preparing court documents in debt collection lawsuits. The company was also charged with violating special rules involving lending to military families. In addition, Cash America was accused of destroying documents relevant to the agency’s investigation of its practices. Last March, the bureau held a field hearing on payday lending and issued a report finding that more than 80 percent of loans by the industry are rolled over or followed by another loan. The Justice Department is reported to be carrying out an investigation of the role of banks in financing payday lenders. The sharks are also under attack at the state and local level. Manhattan District Attorney Cyrus Vance Jr. just announced the criminal indictment of a group of online payday lenders and the individuals who control them. The case is an effort to get at companies that use complicated corporate structures and offshore registration to get around the interest rate caps that states such as New York have adopted. In June, officials in Maryland announced that South Dakota-based Western Sky Financial and CashCall would pay about $2 million to settle charges that they engaged in “abusive payday lending and collections activities” that included loans with annual interest rates of more than 1,800 percent. The settlement also permanently barred the companies from doing any business in the state that required licensing. Last October, five payday lending companies had to pay $300,000 to settle charges brought by the New York State attorney general, and the year before Sure Advance had to hand over $760,000 to settle allegations that it charged illegal rates as high as 1,564 percent. Payday lenders have also been targeted in class action lawsuits. Cash America agreed to pay up to $36 million to settle one such case that had been brought under Georgia’s usury and racketeering laws. Faced with a dwindling number of states in which they can operate as they please, along with tighter federal rules, some of the payday companies are giving up. For example, giant Cash America is reportedly planning to spin off its payday lending operations and focus instead on the supposedly more reputable business of pawn shops. Most stories about attempts to control abusive commercial practices end up with corporations finding a way to prevail. 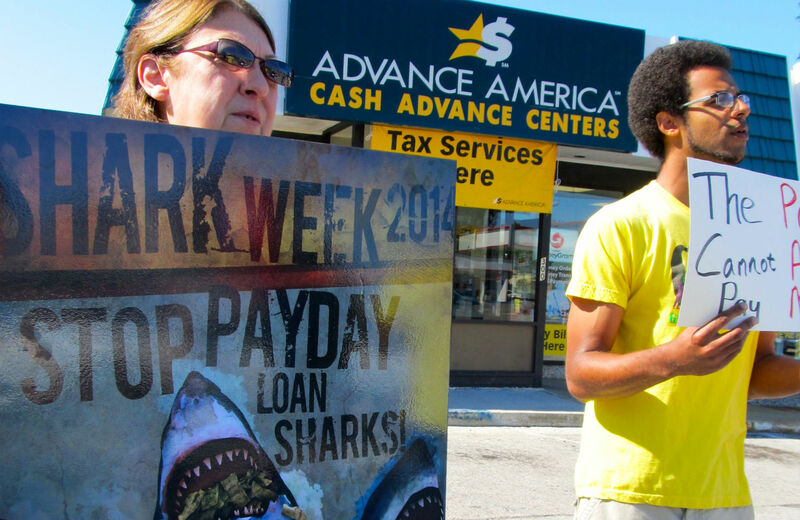 Payday lending may turn out to be that rare case in which the predators lose. The business news has been full of speculation on whether JPMorgan Chase Jamie Dimon will go on serving as both CEO and chairman of the big bank, in light of a shareholder campaign to strip him of the latter post. The effort to bring Dimon down a notch—and to oust three members of the board—is hardly the work of a “lynch mob,” as Jeffrey Sonnenfeld of Yale suggested in a New York Times op-ed. That’s not to say that a corporate lynching is not in order. JPMorgan’s behavior has been outrageous in many respects. The latest evidence has just come to light in a lawsuit filed by California Attorney General Kamala Harris, who accuses the bank of engaging in “fraudulent and unlawful debt-collection practices” against tens of thousands of residents of her state. Failing to redact personal information from court filings, potentially exposing customers to identity theft. JPMorgan got so carried away with what the complaint calls its “debt collection mill,” that on a single day in 2010 it filed 469 lawsuits. The accusations come amid reports of ongoing screw-ups in the process of providing compensation to victims of the foreclosure abuses. For JPMorgan, the California charges also bring to mind its own dismal record when it comes to respecting the rights of credit card customers. In January 2001, just before it was taken over by what was then J.P. Morgan, Chase Manhattan had to pay at least $22 million to settle lawsuits asserting that its credit card customers were charged illegitimate late fees. In July 2012 JPMorgan Chase agreed to pay $100 million to settle a class action lawsuit charging it with improperly increasing the minimum monthly payments charged to credit card customers. In January 2013 JPMorgan was one of ten major lenders that agreed to pay a total of $8.5 billion to resolve charges relating to foreclosure abuses. That same month, bank regulators ordered JPMorgan to take corrective action to address risk management shortcomings that caused massive trading losses in the London Whale scandal. It was also ordered to strengthen its efforts to prevent money laundering. In a move that was interpreted as a signal to regulators, JPMorgan’s board of directors cut the compensation of Dimon by 50 percent. In March 2013 the Senate Permanent Committee on Investigation released a 300-page report that charged the bank with ignoring internal controls and misleading regulators and shareholders about the scope of losses associated with the London Whale fiasco.